Express Scripts is a Fortune 100 company with revenues that top $100 billion a year. As the largest pharmacy benefits management firm in the U.S., its business is to make medicine more accessible for 83 million people. “By making prescription drugs more affordable, more accessible and safer to use, we are helping transform healthcare,” said Brian Gregory, Director of Cloud Strategy and Engineering, Express Scripts. The Express Scripts IT department applies technology to the practice of pharmacy to create a great digital experience for its members, and the employers, health plans and government entities it serves. Competition is fierce, with venture-funded startups hoping to disrupt the leaders in this space. To keep its lead, Express Scripts has overhauled its IT systems, adopting virtualization and Pivotal Cloud Foundry to rapidly bring new apps and services to its customers. “When I think about what we’re doing with our transformation strategy, it’s all about coming up with new and better ways to make technology accessible to my 26,000 colleagues so that each of the 1.4 billion prescriptions we manage is delivered exactly as intended,” Gregory said. The adoption of cloud-native applications and agile methodologies is key to that strategy. Streamlining and simplifying the registration process for home delivery prescriptions seemed like the perfect place to start, Gregory said, because it had the potential to impact the user experience for millions of people, making it easier for them to use home delivery pharmacy services. Express Scripts partnered with Pivotal Labs to rewrite a portion of its member services portal with Pivotal Cloud Foundry. After the engagement ended, developers continued with what they had learned while at Pivotal Labs. This experience injected new skills such as paired programming and working in an agile manner into the organization. Developers were able to shift how they worked and they could deliver value to consumers much faster. 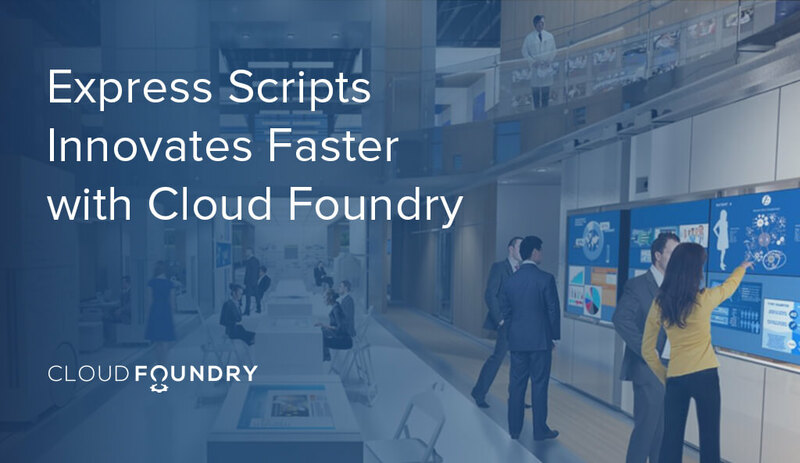 Since adopting Cloud Foundry in June of 2016, Express Scripts has gone from zero to more than 400 application instances in production, and from zero to more than 1200 apps in development (non production). In addition, developers have logged impressive gains in productivity. Compared to the legacy process, which took 45 days from provisioning infrastructure to QA code deployment, time to deployment has shrunk to four hours with the automated pipeline utilizing Cloud Foundry. Even with the first successful app makeover with Cloud Foundry, developer adoption of the new platform started out slowly. Gregory compared it to building a fantastic hotel and assuming people would be waiting to get inside once it was ready, yet when the doors opened, only a handful of people were waiting to enter. To get developers excited about the new platform, they needed to see the capabilities that the platform could offer, Gregory realized. Gregory and team launched a developer roadshow to meet with developers in its three main locations to give them an overview of cloud, Pivotal Cloud Foundry and why this was relevant to them. Developers ended the day with a hands-on lab exercise which sparked a tidal wave of new application development within the company. “Our developers, seeing the value and new capabilities, wanted to learn more about cloud-native applications and how the platform could help them iterate their current and future projects faster,” Gregory said. Developer enthusiasm for the platform is evident in the adoption numbers. In just the past year, PCF users have increased by a factor of 7, from 100 to 700. Gregory predicted that the number of developers working on the platform will reach 1800 by June of 2018, and will top 3000 the year after that. Adopting a platform like Cloud Foundry catalyzes changes in the organization, he said. How will you adapt your release process? How will your developers interact? How will they support applications? How will you work with your business partners? For Express Scripts, this was no different. “We produced code, but now what? You now have to figure out how to get that application running in production so that it’s providing value,” Gregory said. This means solving for compliance in a new way, reinventing your release process and rethinking how applications are owned. Since deploying the new capabilities within Cloud Foundry, Express Scripts has shifted its other processes to embrace the transformation. “We now have stable funding and a product mindset that supports our technology transformation,” he said. For more information, check out The New Stack podcast with Gregory from the 2017 Cloud Foundry Summit.